In Antalya, the pine-clad Toros (Taurus) Mountains sweep down to the sparkling clear sea forming an irregular coastline of rocky headlands and secluded coves. The region, bathed in sunshine for 300 days of the year, is a paradise of sunbathing, swimming, and sporting activities like windsurfing, water-skiing, sailing, mountain climbing and caving. If you come to Antalya in March and April, you can ski in the mornings and in the afternoons swim in the warm waters of the Mediterranean. Important historical sites and beautiful mosques await your discovery, amid a landscape of pine forests, olive and citrus groves and palm, avocado and banana plantations. The Turkish Riviera is Turkey’s tourism capital. Its full range of accommodations, from tourist class to deluxe hotels, and the hospitable people of Antalya will make your holiday comfortable and enjoyable. Set amid amazing scenery of sharp contrasts, Antalya, Turkey’s principal holiday resort, is an attractive city with shady palm-lined boulevards and a prize-winning marina. In the picturesque old quarter, Kaleiçi, narrow, winding streets and old wooden houses abut the ancient city walls. Since its founding in the second century B.C. by Attalos II, a king of Pergamon, who named the city Attaleia after himself, Antalya has been continuously inhabited. The Romans, Byzantines and Seljuks successively occupied the city before it came under Ottoman rule. The elegant, fluted minaret of the Yivli Minareli Mosque in the center of the city, built by the Seljuk sultan Alaeddin Keykubat in the 13th century, has become Antalya’s symbol. The Karatay Medrese (theological college) in the Kaleiçi district, from the same period, exemplifies the best of Seljuk stone carving. The two most important Ottoman mosques in the city are the 16th century Murat Pasa Mosque, remarkable for its tile decoration, and the 18th century Tekeli Mehmet Pasa Mosque. Neighbouring the marina, the attractive late 19th century Iskele Mosque is built of cut stone and set on four pillars over a natural spring. The Hidirlik Kulesi (tower) probably was originally constructed as a lighthouse in the second century. The Kesik Minaret Mosque attests to the city’s long history in its succession of Roman, Byzantine, Seljuk and Ottoman renovations. When Emperor Hadrian visited Antalya in 130 A.D. a beautifully decorated three-arched gate was built into the city walls in his honour. Near the marina the two towers flanking the gate and other sections of the walls still stand. The clock tower in Kalekapisi Square was also part of the old city’s fortifications. In the Atatürk and Karaalioglu Parks, with their colorful exotic flowers and the bay’s shimmering water in front of you and the mountains behind, you will have no doubt why Antalya has become such a popular resort. And Aqua Park, on the eastern coast, has every kind of water sports, including many interesting water-slides. Antalya The award-winning Antalya Kaleiçi Marina and Leisure Center is considered one of the loveliest marinas in Turkey. This center can well meet every tourist’s need worth its many souvenir shops, friendly cafes and restaurants as well as yacht moorings and services. Sail in the morning and enjoy the restful peace of the marina in the afternoon. The old city walls, lit at night, lend an atmosphere of serenity and timelessness. The Antalya Altin Portakal (Golden Orange) Film and Art Festival, held in the autumn, attracts both participants and visitors. The ancient theatre in Aspendos makes an impressive setting for some of the festival’s plays and concerts. Antalya also hosts annual jewellery fairs. That could be more appealing than dreamlike landscapes, grandiose mountains and the magnificent colours of the sea and plants? Then contrast the lively holiday life with the quiet of ancient ruins and you have a perfect vacation. Near Antalya are many things to see and do; below are some suggestions for day-trips. You can walk behind the cascade, a thrilling experience; at the Upper Düden Waterfalls, l4 km northeast of Antalya. On the way to Lara Beach, the Lower Düden Waterfalls plunge straight into the sea. The nearby rest area offers an excellent view of the falls; the view is even more spectacular from the sea. Kursunlu Waterfalls and Nilüfer Lake, both 18 km from Antalya, are two more places of superb natural beauty. The sandy Lara Beach lies about 12 km to the east. Closer to Antalya, but to the west, the long, pebbled Konyaalti Beach offers a view of the breathtaking mountain range. A little further, the Bey Daglari (Olympos) National Park and Topçam Beach provide more splendid vistas. Siçan is a lovely nature island. There are camping grounds at the north end of the park should you decide to linger amid the natural beauty. For a panoramic view of the area drive to the holiday complex and revolving restaurant on top of Tünektepe Hill. Saklikent, 50 km from Antalya, is an ideal winter sports resort on the northern slopes of Bakirli Mountain at an altitude of 1,750 to 1,900 meters. In March and April you can ski in the morning, eat a delicious lunch of fresh fish at Antalya’s marina and sunbathe, swim or windsurf in the afternoon. The wildlife – deer and mountain goat in Düzlerçami Park, north of Antalya are under a conservation program. On the way, you can stop at the astonishing 115 meter -deep Güver Canyon. On the eastern side of Çan Mountain, 30 km from Antalya, the Karain Cave, which dates from the Paleolithic Age (50,000 B.C. ), is the site of the oldest settlement in Turkey. A single entrance, lit by the morning sun, opens onto three large interconnecting chambers. Although the little museum at the entrance displays some of the finds, most of the artifacts are housed in various museums throughout Turkey. Burdur Lake, with nice beaches for swimming, is a superb location for water sports. A climb to the top of Susamlik Hill gives you a panoramic view over the city and lake. The Insuyu Cave, 10 km south on the road to Antalya, is 597 meters long, with nine distinct pools, and chambers filled with stalactites and stalagmites. A hundred kilometres southwest of Burdur, in Gölhisar (Cibyra), are ruins, mostly from Roman times, of an important ancient northern Lycian city with a stadium, lower and upper agora, theatre, necropolis and large aqueducts. 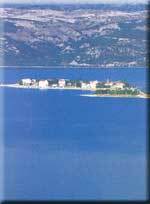 Also in the region, trapped in the mountains 1,050 meters above sea level, is beautiful Lake Salda, an ideal location for relaxation and cooling off on the sandy beaches or in the lakeside cafes, hotels and restaurants. Between Burdur and Isparta, near the town of Aglasun, is the ancient site of Sagalassos, a Pisidian city with ruins from Roman times including a monumental entrance gate, colonnaded street, agora, temple and magnificent theatre. Isparta, high in the Taurus Mountains, is a city of lakes with lovely coastal areas overgrown in the spring and summer with an exuberance of wild flowers. In the city you should stop at the Ulu Mosque built in 1417 by the Seljuks. The Bedesten, or covered bazaar, dates from 1561. Firdevs Pasa Mosque was built in the 16th century by the great Ottoman architect Sinan. Be sure to see the 14th century Isparta Castle. Rose gardens that produce rose oil for the cosmetic industry surround the city and fill it with their sweet scent. Other souvenirs include a thickly piled Isparta carpet. In the nearby hills, the districts of Kirazlidere and Sidre are popular with visitors who want to relax and enjoy the view. South of Isparta, Gölcük Lake, encircled by aromatic pine forests; rests at an impressive 1,405 meters above sea level. Egirdir, at the southern end of Lake Egirdir, is set in idyllic natural surroundings. Among the man-made monuments, Egirdir Castle built by the Lydian King Croesus shows the additions and renovations of the Romans, Byzantines and Seljuks. The Seljuk Kemerli Minare has felt the changes of the modem world – today it stands in the middle of a road. At lakeside restaurants you can sample white bass, the local speciality. A boardwalk connects the shore to Egirdir Island where weavers erect their looms and work outside their houses. On the western side of the lake, up in the hills, Barla’s guest-houses provide a wonderful opportunity for relaxation. Kovada National Park, 30 km south of Lake Egirdir, surrounds Kovada Lake, a pristine and cool mountain getaway. Northeast of Isparta, Yalvaç stands near the ancient city of Pisidian Antioch. This area was visited by St. Paul and St. Barnabas in 46 A.D. Among the ruins be sure to see St. Paul’s Basilica, the aqueducts, Augustus’ Temple, the theatre and public baths as you walk along the city’s marble streets. The Archaeological Museum in Yalvaç itself displays several important regional artifacts. Tourists will find not only leather clothing but many interesting traditional souvenirs made of animal hide. East of Yalvaç, atop Karakuyu Hill, is the sanctuary of the Moon God, Men, and the view from it some is breathtaking. Giant cedar trees grow in Kizildag National Park, south of Yalvaç, amid one of Turkey’s most splendid landscapes. The mountains of the Toros (Taurus) Range is up immediately behind the coast, the whole length – from Konyaalti Beach to the Kirlangiç Peninsula – is a national preserve, the Bey Daglari (Olympos) National Park. The history of this area, the ancient Lycian Peninsula, can be traced back to the Neolithic Age to the settlements at Beldibi. The 42 km of road from Antalya to Kemer pass through spectacular mountain scenery. This resort town has been carefully designed to blend in with the surrounding scenery and offers an ideal environment for a wonderful holiday. A fully equipped Kemer marina has facilities for all activities so that yachtsmen can enjoy the unspoilt bays and beaches south of the town. Shoppers will delight in the wonderful range of high quality souvenirs for sale. A beach promenade north of the marina has steps leading down from its cafes and shops directly to the beach. Kemer Beach is a Blue Flag beach. The term “Blue Flag” coined by the European Union means clean beach. In the Yörük (Nomad) Theme Park you can watch traditional craftspeople at work. The adjoining bay is a charming and delightful spot with many sports and daily entertainment facilities discreetly hidden among the pines. April is the month for the colorful Kemer Carnival. Also in the spring are the yacht races between Kemer and Girne in the Turkish Republic of Northern Cyprus. Kiziltepe, Göynük (Blue Flag) and Beldibi (Blue Flag) north of Kemer and Çamyuva and Tekirova (Blue Flag) to the south, are tourist centres full of various activities. The holiday villages are all designed to blend into the forest that encircles them. At the foot of Mt.Tahtali (Olympos),15 km south of Kemer, the three harbours of Phaselis were once a major commercial center. The ruins of aqueducts, agoras, baths, a theatre, Hadrian’s Gate and an acropolis reveal the city’s historical importance. From the south harbour, look up at Mt. Tahtali for a spectacular view. The sheltered sandy beaches make a superb playground, and the waters are calm and safe for swimmers. The ancient city of Olympos is situated on the southern side of Mt. Tahtali. Oleander and laurel bushes shade the Olympos Valley, which you can approach by land and sea. The play of light on the quiet pools of water enhance the mosaics in the bath. A temple gate and theatre also remain from antiquity. The outer walls and towers around the bay date from the Middle Ages. North of Olympos up from Çirali Beach, is Yanartas (at a height of 300 meters) where according to mythology the Lycian hero Bellerophon, mounted on his winged horse Pegasus slew the fire-breathing monster, Chimaera. Gas which seeps from the earth burns brightly at night at this site, which the Byzantines also considered a religious area. South of Olympos, tranquil waters and sandy beaches line the Bay of Çavus. Here you can waterski on calm waters, discover the colorful marine life or explore the incredible sea caves on the northern shore. An entry port west of Olympos, Finike is surrounded by citrus trees and gardens. A sandy beach stretches to the east, and to the west are rocky bays and coves. Limyra, an ancient Lycian city, is 10 km inland from Finike, via Turunçova. The fourth century B.C. Pericles mausoleum, decorated with caryatids, is a magnificent example of ancient art. The city walls and Roman theatre are also of interest. Farther on this road is the Lycian city of Arikanda. Set high on the mountain overlooking one of Turkey’s most beautiful valleys, the extensive ruins include the agora, theatre, stadium, bouleuterion, water system, gymnasium, baths and scattered sarcophagi. At Demre (Kale), the ancient Myra, (25 km west of Finike), many splendidly carved rock tombs overlook the magnificent Roman theatre. St. Nicholas was the bishop of this Mediterranean city during the fourth century, and died here in 342. Every year in December the Santa Claus Commemoration Ceremony attracts . many tourists who spend their Christmas holidays on the sunny coast of ancient Lycia. Dalyanagzi, the ancient harbour of Andriace, west of Demre, has a good beach for swimming and sunbathing. Kekova is an island an hour from Dalyanagzi by sea as well as the name of a whole ensemble of picturesque islands, numerous bays and ancient cities. These bays provide natural harbours in all seasons, and yachtsmen particularly enjoy exploring the unspoilt landscape. Along the northern shore of Kekova Island at Apollonia, earthquakes have disturbed the land causing some of the ancient houses to sink under the clear water, creating a sunken city. Kaleköy Castle (Simena) offers a bird’s-eye view of the bays, inlets, islands and colorful yachts sailing peacefully on the glassy water. Continuing west out of Kekova, you come to Kas, a lovely spot surrounded on three sides by mountains. The friendly local fishermen are happy to run a water taxi service to take you to a favourite bay, cove or beach along the coast. The swimming and diving are excellent in the clear cool water around Kas. 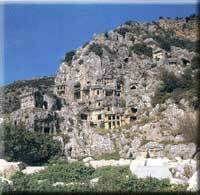 Of ancient Antiphellos, as Kas was once known, only the Lycian rock cut tombs and sarcophagi are left. But the charm of the town remains, and it is a pleasure to wander through the streets, stopping to examine souvenir shops that offer Turkish handicrafts, leather goods, copper and silver items, cotton clothing and the inevitable handmade carpet. After shopping stroll along the flower-lined Akdeniz Promenade or relax under the shade of a palm tree. Kas’s bars and restaurants offer plenty of nightlife. The mountains that surround the town provide their share of activities and sights. You can walk through forested hills to visit remote villages and ancient ruins. The energetic may want to attempt the highest peak in the area, Mt. Kizlar Sivrisi (3,086 meters), or the second highest, Mt. Akdag (3,030 meters). Along the scenic Kalkan road, Kapitas has a beautiful beach, at one end of which is the Turquoise Grotto. A little distance to the west is Kalkan, a lovely small hilltop town that overlooks a tiny bay. Its quaint, traditional, white-washed houses, shuttered windows and balconies garlanded with brilliant flowers that cascade to the streets below, make it the ultimate in a peaceful holiday town. Narrow winding streets lined with souvenir shops lead down to the charming marina. Every morning boats busily take tourists to one of the nearby beaches or small bays. As the sun sets it is Kalkan style to meet on the roof terraces for a drink before dinner and enjoy the comings and goings of the yachts, the business of the marina and the panoramic view. A principal harbour of ancient Lycia, Patara is reached by following a winding mountain road before descending to the site. Here, according to mythology, Apollo was born. More concrete history reveals that this town was the birthplace of St. Nicholas. The ruins are, of course, numerous and interesting. But Patara is also a place for beach lovers. Its 22 km of pure white sand stretches as far as the eye can see, making it a natural choice for all types of beach sports. The remoteness of this undiscovered corner makes it feel like your own private getaway. The ancient Lycian capital of Xanthos, today in the Turkish village Kinik, lies 18 km north of Patara. The theatre, Tomb of the Harpies, Nereid Monument, agora, and Inscribed Pillar, among a mixture of ruins from Lycian, Roman and Byzantine times, create the special atmosphere of this site. At the holy Lycian center of Letoon, six km farther, three temples dedicated to Leto, Apollo and Artemis, familiar gods of mythology, await the exploring tourist. Wide, fertile plains parallel the endless sandy beaches east of Antalya until you come to Alanya. Abundant modern tourist facilities and well- preserved historical sites give you several options for a day’s activities. An important city of ancient Pamphylian, Perge (18 km from Antalya) was originally settled by the Hittites around 1500 B.C. St. Paul preached some of his first sermons here. The theatre’s stage has finely carved marble reliefs; other carvings from around the city are displayed in the stadium. Amateur archaeologists will want to see the handsome city gate flanked by two lofty towers, a long colonnaded road once paved with mosaics and lined with shops, a large agora, the public baths and a gymnasium. Swimmers and sunbathers alike enjoy Belek, a modern luxurious holiday center and golfer’s paradise, 40 km from Antalya. The National Golf Club located in Belek features a wide variety of water sports as well as a championship 18-hole golf course and 9 hole academy course. Visitors may sample some of Turkey’s finest cuisine and enjoy open air discos for evening entertainment. A photogenic Seljuk bridge crosses the Köprü river from the road to Aspendos. The road continues past the Aspendos Jewellery Center to the Aspendos Theatre -the best-preserved theatre of antiquity, with seating for 15,000. Still used today, the theatre’s galleries, stage decorations and acoustics all testify to the architects success. Nearby stand the remains of a basilica, agora and one of the largest aqueducts in Anatolia. And if you have ever wondered how gold dust becomes a fine piece of art or how precious stones are engraved, be sure to visit the Aspendos Jewellery Center, where jewellery making can be observed at every stage in the large workshop. Northeast of Antalya, at the turn off for Tasagil and Beskonak, is the scenic route that leads to the Köprülü Canyon National Park. The twisting road crisscrosses over mountain streams and passes through virgin forests. It is often a slow drive as the view at every turn is more beautiful than the last. The park, 92 km from Antalya, is a valley of wild beauty rich in flora and fauna. The canyon stretches for 14 km along the Köprü River and is 400 meters deep in some places. Fish restaurants dot the rest areas. The Roman Oluk Bridge, which spans the canyon, and the Bügrüm Bridge over the Kocadere stream, are engineering feats of antiquity. From this park you can make two possible excursions – to the ancient city of Selge and to the Dedegöl Mountains. Dedegöl, the highest peak in this mountain range rises to 2,992 meters. An important city of ancient Pisidia, Altinkaya (Selge), northwest of the Köprülü Canyon National Park, is reached by a winding mountain road. The city walls, towers, cisterns, temple to Zeus, agora, stadium, theatre, gymnasium and necropolis remain from this commercial city that stood at an elevation of 950 meters. Historians verify that Selge had direct trade with Antalya, which brought it prosperity. Although the Manavgat Waterfalls are not high, milky white, foaming water rushes powerfully over the rocks. Next to the waterfalls shady tea gardens and restaurants make the falls a pleasant, cool resting spot, especially welcome after a day of sightseeing. You can take a delightful boat trip up the Manavgat river to explore this lovely area further. Side, one of the best-known classical sites in Turkey, was an ancient harbour whose name meant pomegranate. Today a pretty resort town, its ancient ruins, two sandy beaches, many shops and extensive tourist accommodation attract throngs of visitors. There are numerous cafes and restaurants with a view of the sea, and the shops that line the narrow streets sell typical Turkish handicrafts including leather goods and Turkey’s famous beautiful gold jewellery. The magnificent theatre of the ancient city, built on colonnaded arches, is the largest in the whole area. (Closed for restoration) Other monuments include the agora, the Apollo Temple, which is situated near the sea, a fountain and necropolis. The extensive Roman baths, now a museum, houses one of Turkey’s finest archaeological collections. East of Side, tucked in pine forests the holiday resorts of Sorgun, Titreyen Göl (Blue Flag) and Kizilagaç are both popular for their sandy beaches and sparkling sea. The atmosphere is relaxed, the accommodation plentiful and the activities endless. West of Side, the holiday centres of Kumköy, Çolakli and Kamelya also offer sun and sea, in close proximity to ancient sites. In the Pamphlyian Seleucia (Bucaksihlar),15 km northeast of Side, are the remains (in good condition) of Roman baths, temples, churches, a mausoleum, theatre and agora. One of the most interesting and well known caves in Turkey is located in Altinbesik Cave National Park situated 12 kilometres southeast of Aydinkent (Ibradi) and 55 kilometres north of Manavgat. Lakes and interesting rock formations within the cave area as well as travertines and streams make this area especially fascinating. Altinbesik Cave is situated on the western slopes of the Manavgat River Valley and can be reached via the village of Ürünlü which is an authentic village that is a must-see when travelling through this area. The 13th century caravanserai, Alarahan, was built by the Seljuk sultan Alaeddin Keykubat on the banks of the Alara River. On the top of a nearby hill the Alara Fortress commands a view of the whole area. The large popular resort center of Alanya lies at one end of a rocky promontory which juts out into the Mediterranean between two long sandy beaches. A 13th century Seljuk fortress – one of the most magnificent sights on the coast – crowns the headland. About 150 towers punctuate the walls of the well-preserved, double-walled citadel. Within the outer walls are ruins of mosques, a caravanserai and a covered bazaar; in the inner walls are a ruined cistern and a Byzantine church. Although Alanya’s history dates back to Roman times, it rose to prominence under the Seljuks, when in 1220, Alaeddin Keykubat made it his winter residence and naval base. The surviving buildings reflect the importance of the city in Seljuk times. Besides the impressive citadel tourists should explore the unique dockyards and the octagonal Kizil Kule (Red Tower). Alanya is a beautiful holiday center of modern hotels and motels, numerous fish restaurants and cafes and bars. The cafes that ring the harbour have become popular gathering places for tourists. From the town’s lovely park, the road runs along the coast to the harbour, lined with countless boutiques that tempt tourists with handicrafts, leather, clothes, jewellery, handbags and the amusing painted gourds, a symbol of the area. In August, when Alanya hosts a colorful International Folklore Festival the atmosphere is charged with vitality and gaiety. If you enjoy exploring you should visit the Damlatas Cave to see the eerie misshapen rock formations. Nearby is the Archaeology and Ethnography Museum, (Open weekdays except Monday). A boat can take you to the three sea grottoes: Fosforlu Magara with its phosphorescent rocks, the Kizlar Magarasi, where pirates imprisoned their female captives, and the Asiklar Magarasi. When the intense sun overpowers you, take a day trip to the Dim Çayi Valley, 15 km east of Alanya, where you can relax in the shade of this scenic valley and listen to the stream rushing by. Avsallar (Incekum), about 25 km from Alanya to the west, is a holiday resort center with fine sandy beaches. If you travel east from Alanya towards Gazipasa you will discover and no doubt linger on the exceptional beaches. 30 km east of Alanya, Aytap, the historical harbour city lotape, is a great excursion site, with Roman ruins, secluded beaches and bays. Mark Antony gave the lovely Cilician shores, the land between lanya and the Syrian Border to Cleopatra, as a wedding present. Also associated with the region’s past is St. Paul a native of Tarsus. Today the region is known for its fertile soil which produces abundant crops, and for the hospitality of the region’s denizens. Surrounded by densely cultivated market gardens, Mersin, the provincial center of Içel, lies midway on the eastern Mediterranean coast of Turkey. Its shady palm-lined avenues, city park and modern hotels create a pleasant ambience from which to visit the nearby historical sites and numerous beaches. A rapidly developing city and the largest free-zone port on the Turkish Mediterranean, Mersin has a regular car ferry service to Gazimagosa (Famagusta) in the Turkish Republic of Northern Cyprus. In the fish market, sample the fresh catch in one of the several inexpensive restaurants, other local delicacies include cezire, a local confection of carrots roiled around a walnut center, and biberli ekmek, a small pizza topped with a spicy meatless sauce. Despite its very modem appearance, Mersin occupies the site of an extremely ancient city. At the Yumuktepe tumulus, three kilometres west of town, excavations have unearthed several successive settlements dating back to the Neolithic Age. 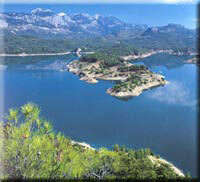 The road from Mersin to Silifke closely follows the coast, passing by pine forests and orange groves. On one side lie the ruins of cities, basilicas and tombs, on the other a series of small secluded coves with sandy beaches. 13 km west of Mersin, a row of Corinthian columns that once lined the main street, remain at Viransehir (ancient Pompeiopolis), founded in 700 B.C. by Rhodians. At Kanlidivane are the ruins of ancient Kanytelis, with tombs resembling small temples, churches and sarcophagi dating from Roman and Byzantine times. The city itself and the ruins are all on the sides of a deep chasm. 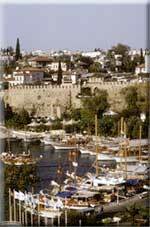 Kizkalesi, a holiday resort and the ancient site of Korykos, has fine sandy beaches, motels and camp sites. The Castle of Korykos on shore faces another fort, Kizkalesi (Maiden’s Castle), that stands on a tiny island 200 meters offshore. Formerly a sea wall joined the two fortresses. Just beyond Kizkalesi, on a bay lined with fish restaurants at the little fishing village of Narlikuyu, is a Roman mosaic depicting the Three Graces. Farther on are the deep chasms known as Cennet-Cehennem (Heaven and Hell). In the Vale of Heaven are the ruins of a fifth-century chapel. Nearby in the deep Narlikuyu Cave, full of stalagmites and stalactites, the humid air is believed to aid sufferers of respiratory diseases. The Mausoleum of the Fearless King (Mezgit Kalesi) is 12 km north of Susanoglu Beach and 2.5 km east of Pasli Village. The mausoleum facade is 8 meters high, with Corinthian columns and a 1 meter-high relief of Priapos on the base. It is the largest mausoleum and dates from Roman times. Located slightly inland, Silifke (90 km from Mersin) spreads out at the foot of a hill. Crowned with a citadel this piece of high ground was formerly the acropolis of ancient Cilician Seleucia. In the town a Roman bridge crosses the ancient Calycadnos River, today called the Göksu. Atatürk once stayed in a local turn of-the-century house that has now been converted into the Ethnography Museum. The Silifke Archaeology Museum, on the way to Tasucu, is filled with relics from all over the area. In Demircili ( the ancient Imbriogon), north of Silifke on the way to Uzuncaburç; there are well-preserved monumental tombs of the early Roman period. The drive up the mountain road to the magnificent ancient site of Diocaesarea, Uzuncaburç, at 1200 meters, is lined with large tombs. The remains of the impressive Temple of Zeus Olbius, the some Temple of Tyche, a monumental arch, theatre, Byzantine church, and tower are outstanding. Four kilometres to the east, the ruins of Olba (Ura) – the Roman aqueducts, theatre, and fountain — make a quick tour well worthwhile. Continuing along the coast road south from Silifke you come to Meryemlik (Ayatekla), a Roman necropolis with the tomb and church of St. Thecla, the first female martyr. Tasucu, with good. accommodations for tourists, is a resort town with sandy beaches and a harbour. A regular sea bus and ferry boat service connects the town with Girne in the Turkish Republic of Northern Cyprus. Ovacik, 44 km west of Tasucu, is a quiet spot well-known for its fisherman’s wharf and beach. The Peninsula (ancient Cavaliere) of Ovacik is one of the natural highlights of Turkey, an area ideal for diving. If this sport interests you, visit Kösrelik Bay and Kösrelik Island. Off the coast of Kösrelik Bay, you will find Roman ruins and beautiful mosaics in Afrodisias,18 km southeast of Ovacik. Aydincik, to the west of Ovacik, clearly marks the surrounding sailing waters ensuring safety for the yachts that ply this breathtaking stretch of coast. The shore road that clings to the pine-clad mountain slopes, which plunge steeply down to the sea, offers spectacular views of cliffs, coves and the brilliant turquoise waters of the Mediterranean. Another 36 km to the west of Aydincik, Bozyazi is a holiday center with clean and roomy camping sites along its wide beaches. The fine, well-preserved Anamur Castle, set between two curving sandy beaches, commands a splendid view of the coastline. Originally built by the Crusaders in the Middle Ages, it later served as an Ottoman stronghold. 138 km from Silifke and a few km inland, the town of Anamur, is nestled in the mountains with banana plantations surrounding it. Just west of town on a beautiful beach are the ruins of ancient Anamorium with double ramparts, a theatre, Odeon, bath and necropolis. Situated in tiers above the sea, it’s perfect for a climb to the top which overlooks one of the cleanest and most pristine seaside in Turkey. East of Mersin, on the edge of the fertile Çukurova Plain, is Tarsus, the birthplace of St. Paul. Of ancient origin, the city was invaded and destroyed on several occasions and only a few monuments of particular interest remain: the Cleopatra Gate, through which Mark Antony and Cleopatra passed when they came to Tarsus to meet, an ancient church, and the Ottoman Ulu Cami. You can get the feel of bygone days if you walk though narrow streets past old houses to find St. Paul’s well. Little streams, waterfalls and shady trees at the Tarsus Falls on the outskirts of town create an idyllic afternoon. The Karaburçak Park is perfumed by its groves of eucalyptus trees. Set in the heart of the Çukurova (Cilician) Plain, Turkey’s fourth largest city, Adana is at the centre of the rich agricultural region and a thriving textile industry. The Tasköprü (Stone Bridge) built by Hadrian and repaired by Justinian, spans the River Seyhan which bisects the town; only 14 of the bridge’s original 21 arches still stand. Of interest in the city are the 16th century Ulu Mosque, the Eski Mosque, the Hasan Aga Mosque, the 19th century clock tower and the old covered bazaar. The city’s three museums, the Archaeological Museum, which displays locally excavated Hittite and Roman remains, the charming Ethnography Museum, and the Atatürk Culture Museum should be included in a tour of the city. After a day of sightseeing you can sample Adana kebab, a sensational spicy tube of ground meat. Local beverages include salgam, a drink made from dark turnips and sira, a type of grape juice. North of the city, the Seyhan Dam and Lake have shady walks and quaint tea gardens and restaurants creating a cool place to escape the heat. At sunset, look back toward the city to the peaceful, winding ruby river, lined with twinkling lights. The nearest beaches with accommodation facilities are at Yumurtalik, where an ancient harbour castle dominates the picturesque fisherman’s wharf, and at Karatas. Fishermen enjoy the scene, and the catch, at Çamlik Park. Off the road from Adana to Iskenderun, near Yakapinar, lies Misis, a city which derived its wealth from its position on the Silk Route. There are several Roman ruins at the site, including a beautiful fourth-century mosaic depicting Noah’s Ark and the animals. Further along the road are the impressive ruins of the Yilanlikale castle, atop a rocky peak that dominates the Ceyhan River. South of Yilanlikale, in the Sirkeli region, a somewhat weathered Hittite relief marks Muvattalish’s stop here on his way to Egypt. North of Ceyhan lies the village of Dilekkaya, (the ancient Anavarza), where you can view the ruins of a Roman-Byzantine city and an impressive castle. The small museum at the site has two particularly fine mosaics from Roman baths. Osmaniye, inland from the head of the Guff of Iskenderun, is the turn-off for two more ancient sites. The road to Karatepe takes you to the ancient Roman city of Castabala, where a colonnaded street, theatre, baths and a fortress on the hill evoke a bygone era. At the Karatepe National Park, (the neo-Hittite site), the remains of the summer residence of King Asitawada, tablets bearing Hittite and Phoenician inscriptions and an open-air museum with fine bas-reliefs reveal the importance and astonishing aesthetic of this pre-historic civilisation. This region was much fought over during the Crusades and the impressive fortress at Toprakkale was for a time held by the Christian armies. Further back in history, Alexander the Great defeated Darius III and the Persian army in 333 B.C. at the Plain of Issos (Dörtyol). Today this area is covered with large citrus groves which supply Turkey with oranges, tangerines and lemons. At Yakacik (Payas), off the highway that outlines the coast of the Gulf of Iskenderun, the splendid 16th century Sokollu Mehmet Pasa Complex includes a mosque, bath, bazaar, caravanserai and medrese. Other monuments include the Cinkulesi (Tower of Jinns) and a castle. Iskenderun, formerly Alexandretta, was founded by Alexander the Great after his victory over the Persians on the Plain of Issos. Today it is a busy commercial center and port with a fine harbour. Excellent hotels, restaurants and cafes line the seafront surrounded by parks and palm trees. The culinary speciality of Iskenderun is delicious prawns. Gourmets should also try künefe, a hot dessert of sweetened shredded wheat filled with melted cheese, and humus, an appetiser of pureed chickpeas, garlic and paprika. Good souvenirs include handcarved wooden tables and chairs and other objects of wood. On the coast south of Iskenderun, the holiday town of Uluçinar (Arsuz) has good beaches, hotels, guest-houses and restaurants. On the way to Antakya, off the main road, is the mountain resort of Sogukoluk where you can retreat in the summer from the blazing sun. After you cross the Belen Pass, stop at Bagras Castle, held at various times by the Byzantines, Mamluks and Crusaders. Antakya, the biblical city of Antioch, lies on the Asi River (Orontes) on a fertile plain surrounded by grand mountains. Once the capital of the Seleucid kings, it was notorious for its wealth and luxury. In Roman times, the city continued to thrive with commerce and culture. It featured prominently in early Christianity and St. Barnabas, St. Paul and St. Peter all visited the city. The Antakya Museum houses one of the richest collections of Roman mosaics in the world, (Open weekdays except Monday). These fantastic mosaics in stone were uncovered mostly at excavations in Antakya and nearby Daphne. Outside the town, the Grotto of St. Peter is the cave church from which the apostle preached for the first time and where he established the Christian community. In 1983 the church was declared a holy site by the Vatican. Other places of interest include a bustling bazaar and the Mosque of Habib Neccar. South of the grotto, the Iron Gate was one of the actual entrances of biblical Antioch. Strolling through the old part of town, you cannot help recalling that St. Paul, St. Peter, St. Barnabas, and other saints walked these streets, for little has changed since that time. The Castle of Antioch, set high above the city, offers a magnificent view over the city and the plain. South of Antakya is Harbiye, the ancient Daphne, where, according to mythology, Apollo tried to make the wood nymph, Daphne, his lover. To escape him, she changed into a laurel tree. The city was a luxurious suburb in Roman times. Covered with orchards, gardens, laurel trees, and waterfalls, this is an excellent place for a good meal. In October, the delicious Harbiye dates are in season. Wonderful laurel-scented soap can be purchased here. Samandag, 25 km from Antakya, is a resort town with a pristine beach. Seleucia Peria (Çevlik), north of town, was founded around 300 B.C. and by the time St. Paul and St. Barnabas made their first missionary journey here it was a busy port. The most interesting monument to see is the Tunnel of Titus, built to divert rain water. Even by today’s standards it is a tremendous engineering achievement. You should drive to Kapisuyu village for the spectacular panorama from the Zeus Temple of the ancient harbour, sandy beach and fertile plain. Two roads lead from Antakya to Syria: the one to the east and Aleppo passes through the frontier town of Reyhanli; the one to the south goes through Yayladag towards Lazkiye, Tripoli and Beirut.